The solution is simple to change the keyboard speed on Windows 10, and to make keyboard character repeat faster or slower! By changing the keyboard settings you can work better and more efficiently not only when you insert predefined text in programs via Windows keyboard shortcut. At this point you can also set the symbol ergo cursor repeat rate and the cursor blink frequency. The Keyboard Properties window is located in the Windows 10 Control Panel, symbol keyboard ! 1.) ... The Keyboard Properties in Windows 10! 2.) ... Problems with the keyboard input language? 1.) The Keyboard Properties in Windows 10! The Keyboard Properties window is in the Windows 10 Control Panel, point keyboard! In Windows-10 Keyboard Properties, you can very easy change the keyboard Repeat delay. Shorter delay = faster keyboard and a faster Repeat rate (... see Image-1 Arrow-3)! Optionally, you can customize the Windows 10 Cursor speed (blink rate) (... see Image-1 Arrow-4). Tip: In Windows-10, you can get to accessibility settings from the desktop. To do this, press the [Windows logo] + [U] key! 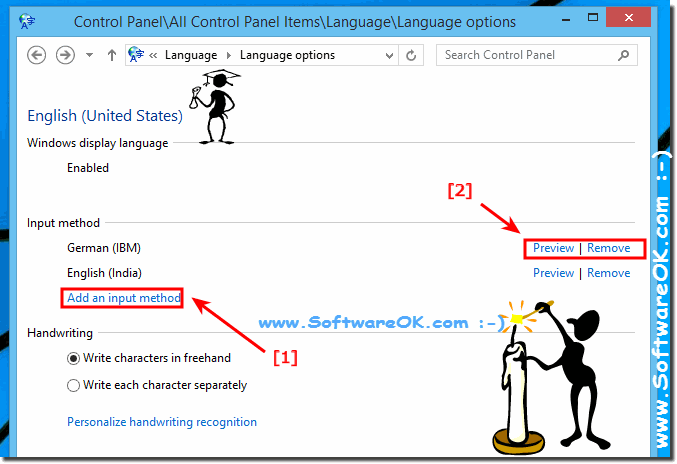 (Image-1) Change keyboard Typing speed on windows 10! By using the Windows 10 keyboard correctly, you can avoid pain or wrist, hand and arm injuries. This is especially true if you work at the computer for a long time. Place the keyboard at the height of the elbows. Your upper arms should be in a relaxed position next to your upper body. Center the keyboard in front of you. If the keyboard has a ten-key pad, you can use the space bar as the starting point for centering. Write with your hands and wrists floating above the keyboard so that you can use the entire arm to reach more distant keys instead of reaching out. Avoid placing your palms or wrists on a surface while writing. If the keyboard is equipped with a palm rest, you should only use it during the write pauses. Tap lightly and keep your wrists straight as you type. Relax your arms and hands if you do not write. Interrupt computer work every 15 to 20 minutes with short breaks on Windows 10 and all other operating systems. An also useful solution is how to simple Find Character Map on Windows 10 or start it over the run dialog! (Image-2) Customize Windows 8.1 keyboard speed (faster, slower and repeat)! Please Customizing your Windows 10 keyboard and the keyboard settings that helps you to work better and more efficiently on Windows 10. If customize the settings, you can determine how long you must press a key before the keyboard character starts (keyboard repeating), this is the speed at which keyboard characters repeat, and the rate at which the cursor blinks. 2.) Problems with the keyboard input language? Many Windows-10 PC beginners find it difficult to change the input language. This happens both while typing and when logging on to the system. Often, the question arises of how to set these Windows parameters, and how to personalize the keyboard layout. Here's the solution: ► Change the language for the keyboard layout in Windows 8.1 / 10! 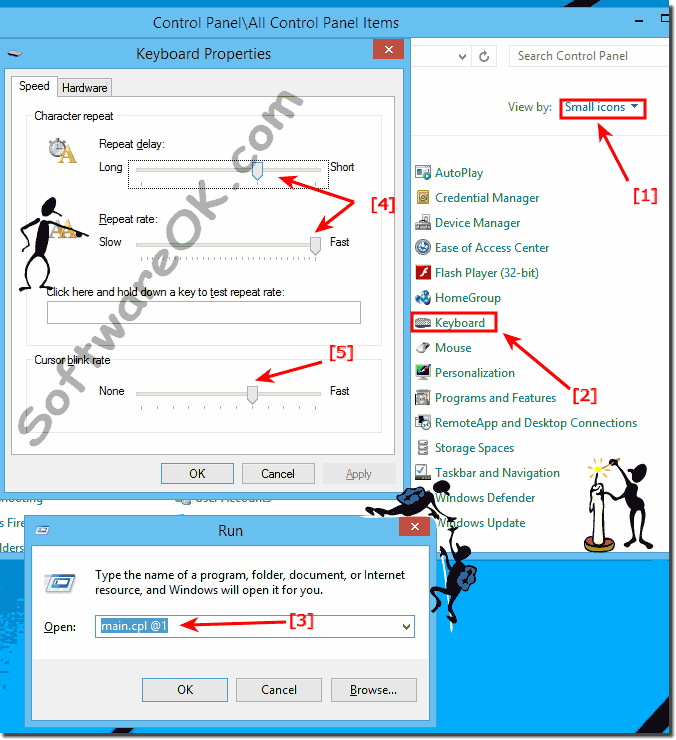 (Image-3) Add new input method or change keyboard layout in Windows 10! Windows-10 - FAQ-51: Typing speed is slow on windows 10, how to change keyboard speed?